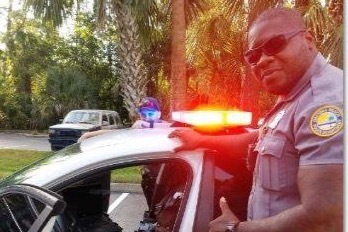 A hero within the Daytona Beach Police Department PBA family could use your help. Officer Kevin Hird was shot by a career criminal with an AK-47 while working Sunday night and responding to a call for service. He is recovering now after surgeries and will fight to return to work once he is able. In the meantime, this rising star within the agency will be placed on light duty, which means he will be unable to work outside details or voluntary overtime, which are things often important in the life of an officer. To that end, the Coastal Florida PBA is helping raise funds for Officer Hird to help offset the lost wages. His recovery is expected to take several months. Kevin took a bullet while serving the citizens of Daytona Beach. Let's help raise funds for him as a way of showing appreciation for the work he does, and respect for the injuries he sustained while wearing the uniform. Please help spread the word and let's give Kevin a needed boost. At Kevin's request in the hospital Wednesday, this page was set up with his girlfriend Rosemery Franco as the beneficiary so she will be able to withdraw it on his behalf while he recuperates.